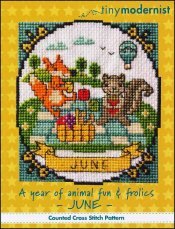 A Year Of Animal Fun & Frolics: June [H1722] - $6.00 : Yarn Tree, Your wholesale source for cross stitch supplies. Cross stitch pattern from Tiny Modernist. Look at these adorable squirrels enjoying their picnic lunch, as a hot air balloon fly's in the background. Stitch count 53w x 61h.